Eva Geraldine Fontanelli has been one of my main modern style inspirations for quite some time. 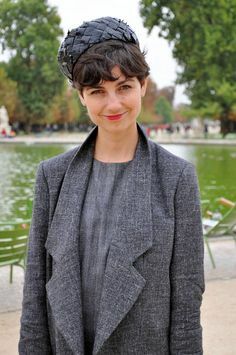 I first came across her on The Sartorialist a few years ago, I immediately fell in love with the playfulness of her fashion sense and her infectiously joyous demeanour. Prints and patterns are a staple in Eva's wardrobe. Leafy, striped, or floral, she does not shy away from them. She'll play them up with a variety of accessories, like pastel heels, Stan Smiths, or a fun fur hat. Thanks to Eva, I know that I need a fluffy skirt in my life. Possibly one in every colour. She shows how this skirt can be softened with a light sweater and low block heel.Or jazzed up with an embossed leather jacket. I adore her pairings of long coats with different textures and colours. Look how lush the fringe coat and hi top Nike Air Prestos combination is. Not just long coats, but also long skirts and dresses. Instagram or blog for some ideas. It just always seems like she is being herself, that she is comfortable and having fun. 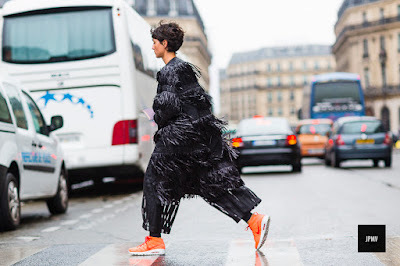 If you are a fan of quirky and playful fashion, check out more of Eva of style. You won't be disappointed.